Divine Llama Vineyards pairs fine wines with friendly llamas in the Yadkin Valley. Llamas and wine, you ask? It may seem like a quirky mix, but the unique experience enthralls and attracts visitors from across the state. The Yadkin Valley, North Carolina’s first American Viticultural Area, is home to more than 40 vineyards — but only one of those vineyards offers companionship from an adorable, wooly creature alongside its wine varieties. Divine Llama Vineyards, located just northeast of Winston-Salem in East Bend, North Carolina, is home to the state’s largest llama farm, and an award-winning selection of wine. The vineyard opened its tasting room in 2009, and offers wine tastings and self-guided tours of the farmland. For those looking to spend quality time with the llamas, the vineyard also offers guided llama treks; the best visits end with guests taking home a bottle of wine and a photo with a llama to commemorate the day. Llamas and wine are a quirky mix, and co-owners Michael West and Tom Hughes are the first to admit it. Neither one of them could’ve seen this business venture coming. But unorthodox as it may seem, the unique pairing enthralls and attracts visitors from across the state. 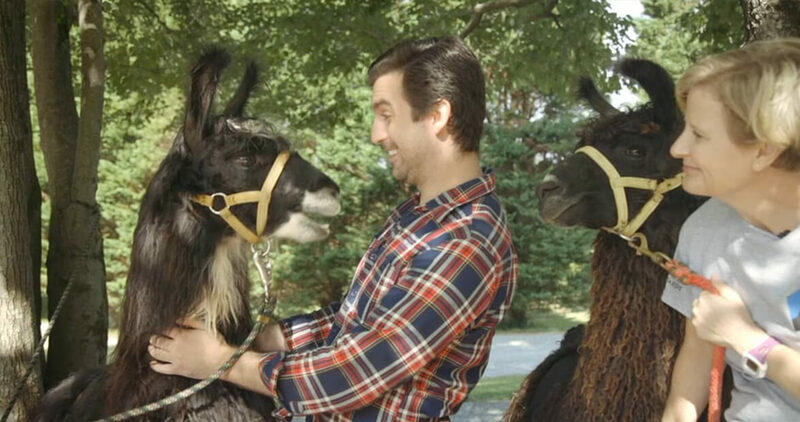 “Once you cuddle with a llama, you can’t go back,” llama trek leader Leslie Messick says. In fact, that’s how she and her husband ended up here; nearly two years ago, the Messicks visited Divine Llama Vineyards for an afternoon of wine tasting — or so they thought. “Mike [West] was out with a llama named Bentley and he said, Do you want to walk him? We said, Sure! Literally a month later, we owned two.” Now a part of the business, the Messicks guide organized treks for groups of up to 15 people in the fall, winter, and spring months. Each trekker is able to lead their own llama on a two-hour-long adventure; the two-mile trail goes through the forest, across creek crossings, and over rolling hills. Adult llamas are able to carry up to 80 pounds for upwards of eight miles a day, which allows trekkers to pack snacks and gear for while they’re out on the trail. Although the farm is home to around 60 llamas, only the male llamas are taken on treks because they are typically more people-friendly. While llamas are native to the Andes Mountains in South America, “These are Carolina llamas,” Messick says, affectionately. Many of the fairer-fibered llamas on the property have an orange tinge to their coats from rolling around in the North Carolina red clay soil. Llamas are bred for their personalities and fiber; the majority of the llamas here are either medium or heavy fibered llamas. When the llamas are shaved in the spring, their fibers are spun into yarn or made into knitted products that are sold in the vineyard’s taproom. Some of the llamas on the farm even participate in show competitions, similar to dogs. In the llama competition circuit, many of Divine Llama’s competitors are champions, including Merlot and Icebreaker, which both won multiple divisions in a show in Georgia earlier this month. When the llamas aren’t working, they can be found roaming the pastures of the 77-acre property along with the farm’s miniature horses, donkeys and chickens. As for the visiting trekkers, when it’s time to relax after a day’s worth of traveling, tie your llama up outside and head into the tasting room at the front of the property. Divine Llama Vineyards is celebrating a milestone this year. 10 years ago, co-owners Michael West and Tom Hughes planted their first grapes at the vineyard — but a decade is merely blip in their friendship of more than 40 years. Now, the vineyard grows four types of grapes: two red, Merlot and Cabernet Franc, and two white, Chardonel and Traminette. Using these four grape varietals, the vineyard then explores barrel materials and blending techniques to produce 8 to 10 distinct wines. “We use three different barrels usually when we’re making our reds: Hungarian, American, and French oak,” Hughes says, “If you try the wine out of all three of those barrels you would think it’s a different wine.” Blending wines aged in different barrels also allows for the wines to assume more complex flavors. The vineyard’s name is also a co-mingling of llamas and wine. “My son came up with Divine Llama, with having the word vine in there. It’s a little play on words,” Hughes explains. It’s fitting; most day-trippers love to mix the wine and llama aspects when they come for a visit. It’s believed that spending time with farm animals can be a catalyst for people to de-stress, as it removes them from the hustle and bustle of everyday life. “People tell us when they come out to this property, that once they turn into the driveway, it’s such a relaxing setting underneath the trees,” Hughes says. Nestled in one of the rocking chairs on the front porch of the tasting room, with sprawling views of the vineyards, it’s easy forget that you’re 20 minutes outside of Winston-Salem. But make no mistake: This slice of serenity is right here in the Triad, waiting for you with open arms, a glass of wine, and a herd of new llama friends.